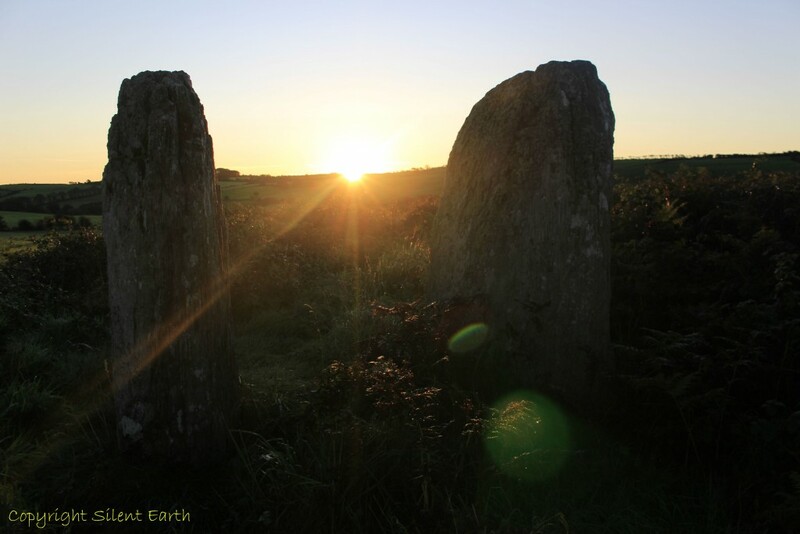 On Thursday 21 September 2017, with the kind permission of the landowner, I observed the Autumn equinox sunrise over a near cloudless horizon at Bohonagh Stone Circle east of Rosscarbery in Co. Cork, Ireland. 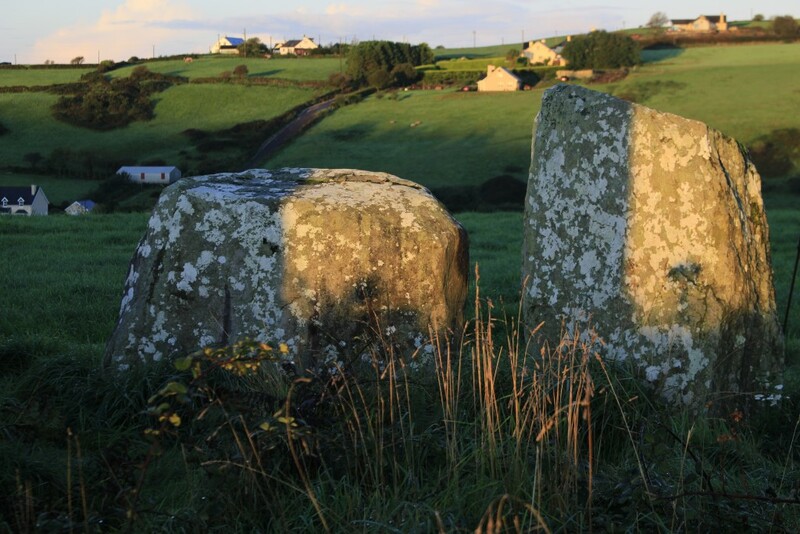 This is a stone circle of the Cork/Kerry series in the recumbent style, and originally consisted of 13 stones. 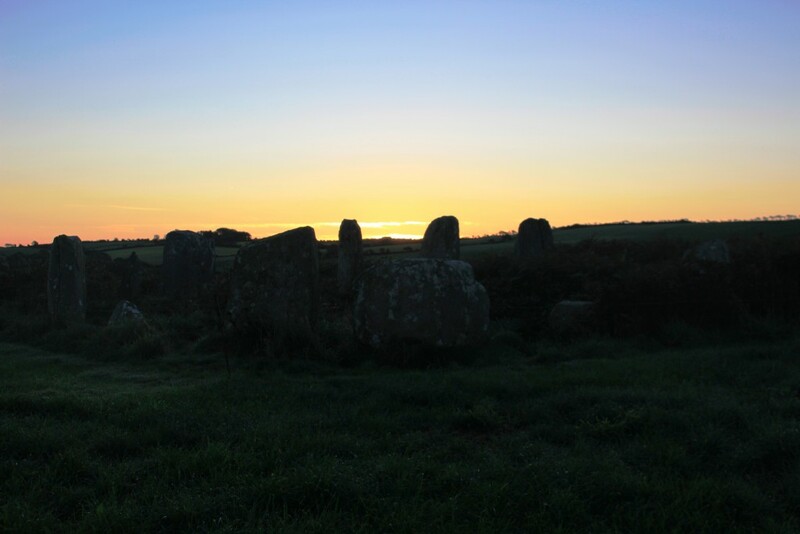 There is a well defined axial orientation of the two portal/entrance stones and the recumbent stone on the opposite side of the circle to the equinox sunrise around 21 March and 21 September each year. Dr. Edward M. Fahy excavated the site in the Autumn of 1959, establishing that 6 of the original stones remained in position, three others had fallen, and four had been taken by ‘stone robbers.’ On completion of the excavation the three fallen stones were re-erected under the supervision of Dr. E.M. Fahy into their original sockets. 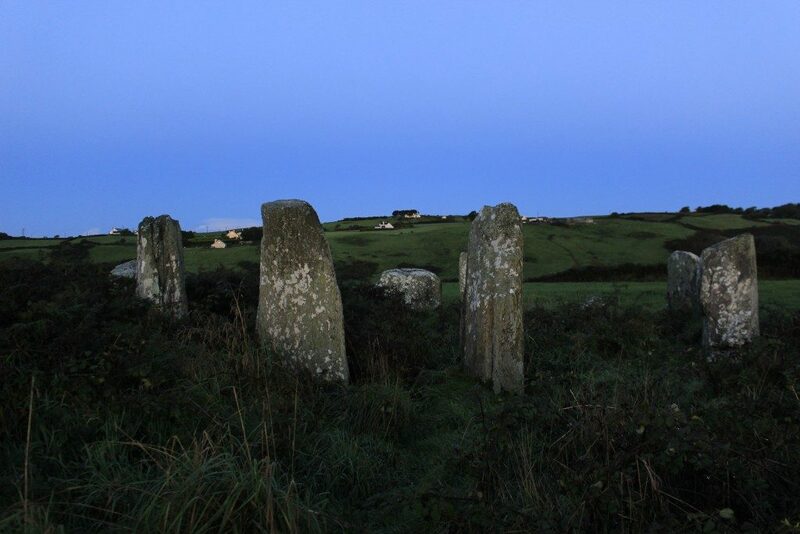 Below: Approaching the stone circle at dawn with Venus visible in the clear sky that morning, the nearby boulder burial 20 yards to the southeast of the circle is seen here. Two of the three supporting boulders of the capstone are of quartz and the third is comprised of a similar sandstone to the stones of the nearby stone circle. A number of cup-marks, each of approximately 2 inches in diameter, are visible on the upper surface of the capstone. 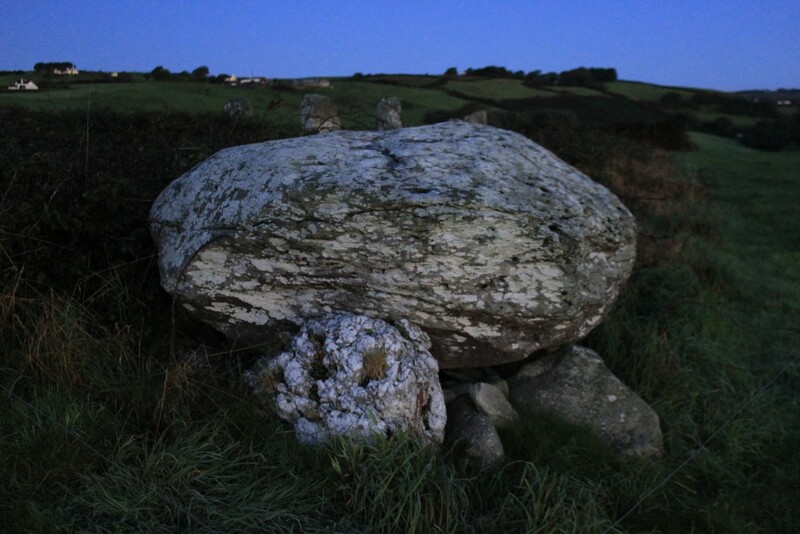 Dr. Fahy’s excavations revealed a cremation pit burial within the stone circle (as he similarly discovered during excavations at the nearby stone circles of Drombeg and Reenascreena) and a burial under the dolmen above. Below: On arrival at the stone circle before sunrise, viewed here from the east with portal Stones 1 and 13 (left to right) central in the photograph and the recumbent Stone 7 on the opposite side of the circle to the west. 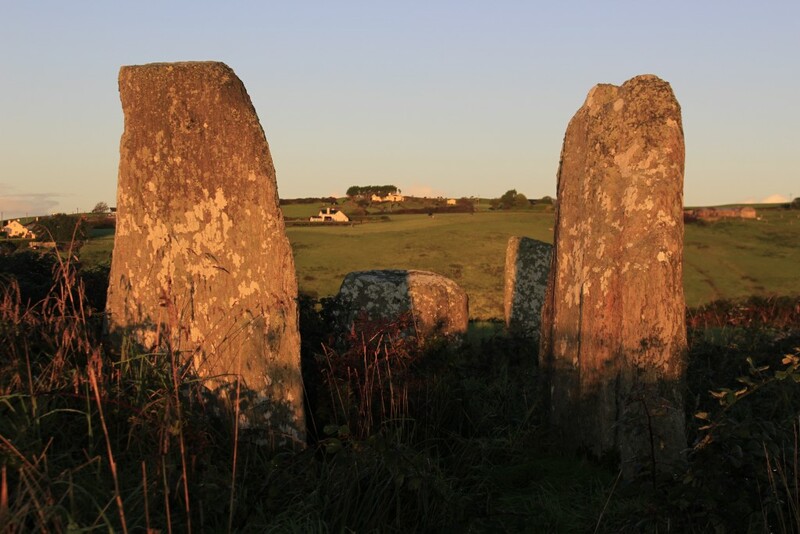 Below: Viewed from west of the recumbent Stone 7 (central foreground here) across the portal entrance Stones 13 and 1 on the opposite side of the stone circle, before the first glimmer of the sun’s rays breaks the horizon to the east. Viewing to the east before sunrise. 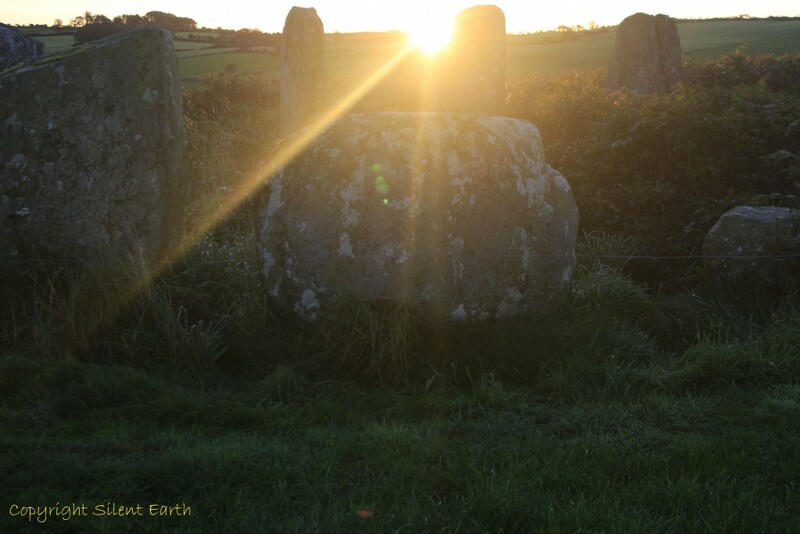 Below: From immediately west of the recumbent Stone 7, the first rays of morning sun enter into the stone circle between the portal entrance stones and pour over the recumbent stone like a spear of molten gold. The published local time of sunrise that morning was 7:20 am and the first glimmer of the sun’s rays appeared over the hill on the eastern horizon at 7:32 am. The photograph below was taken at 7:35 am, before the full orb of the sun was visible above the horizon. 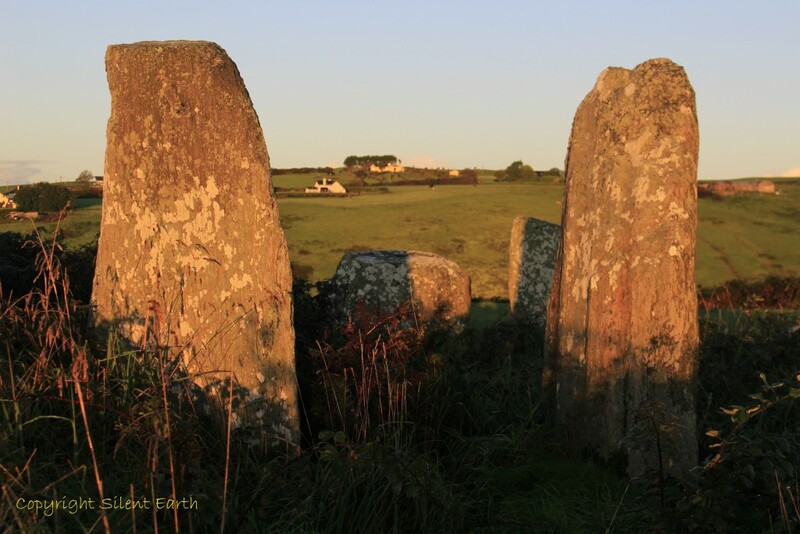 Below: from the centre of the stone circle looking east through the portal entrance Stones 13 and 1 at 7:36 am. Viewing between the portal entrance stones 13 and 1, the rising sun at 7:36 am. 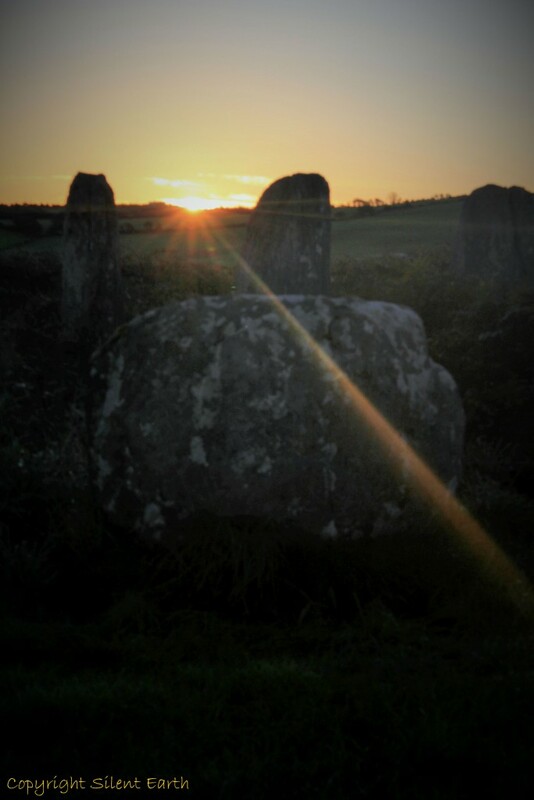 Below: By 7:38 am the sun had risen high enough in the sky for portal entrance stone 1 to the east to cast a shadow on the left hand side of the western recumbent stone. Stone 8 to its right is also partially in a shadow cast by Stone 13. Below: Nine minutes after the sun first appeared over the eastern horizon, at around 7:41 am on equinox morning, one of only two days a year when the time of light and the time of darkness in the whole day are each exactly 12 hours in length, the recumbent stone is observed half in shadow and half in light. Shadow on the recumbent stone at 7:41 am. By 7:52 am, exactly 20 minutes after the first rays of the sun broke the eastern horizon, the shadow falling from portal entrance Stone 1 onto the recumbent stone is centrally placed. Shadow of portal Stone 1 falling on the recumbent stone at 7:52 am. Below: A union in shadow of portal Stone 1 and recumbent Stone 7 further unfolds as the shadow of Stone 1 moves during the next 10 minutes from left to right (south to north) across the recumbent stone. 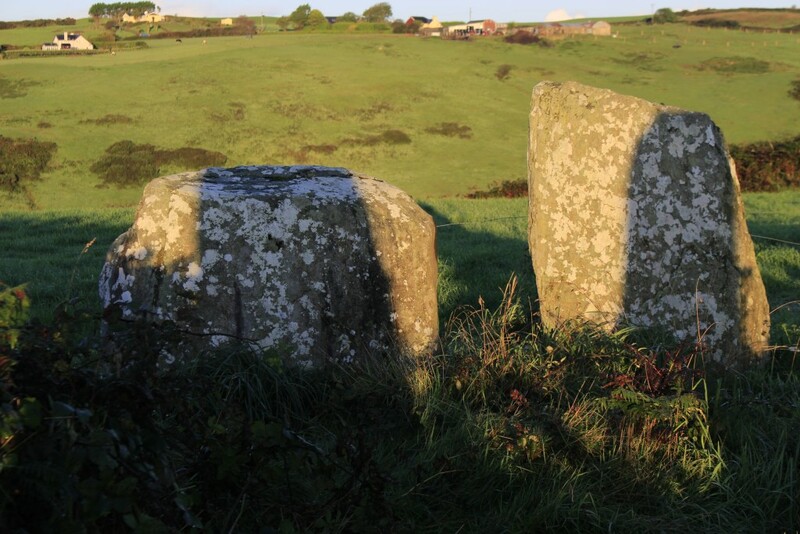 As can be seen from the photograph below taken at 8:02 am, the shadow cast by the portal entrance stone on the recumbent stone has moved across to the right-hand side of the recumbent stone. The shadow of portal stone 1 falling onto the recumbent Stone 7 at 8:02 am. Thank you to Dr. Terence Meaden for the inspiration and mentoring, and the landowner at Bohonagh for permission to visit the site to make these observations. 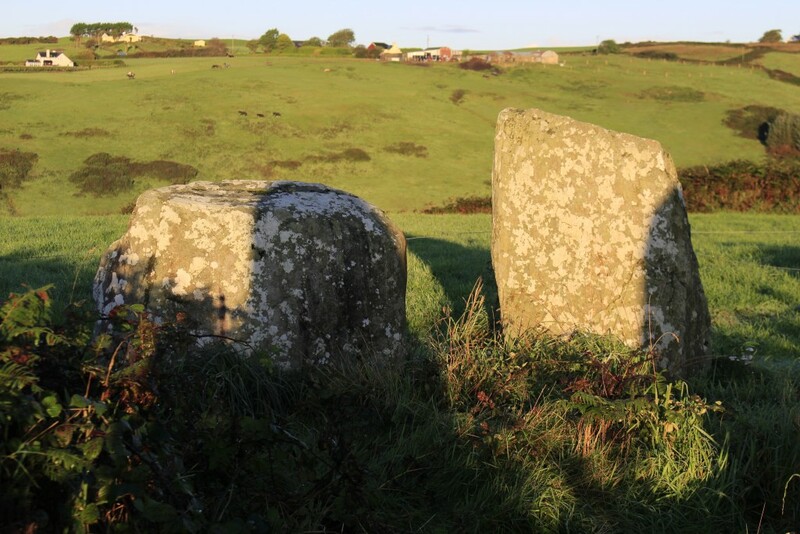 Bohonagh Stone Circle is on private land within a working dairy farm and, as a result of this, inevitably health and safety issues are a concern in visiting this stone circle.